I’ve been feeling very under the weather and a little sorry for myself over the past few days, and in need of something to cheer me up. 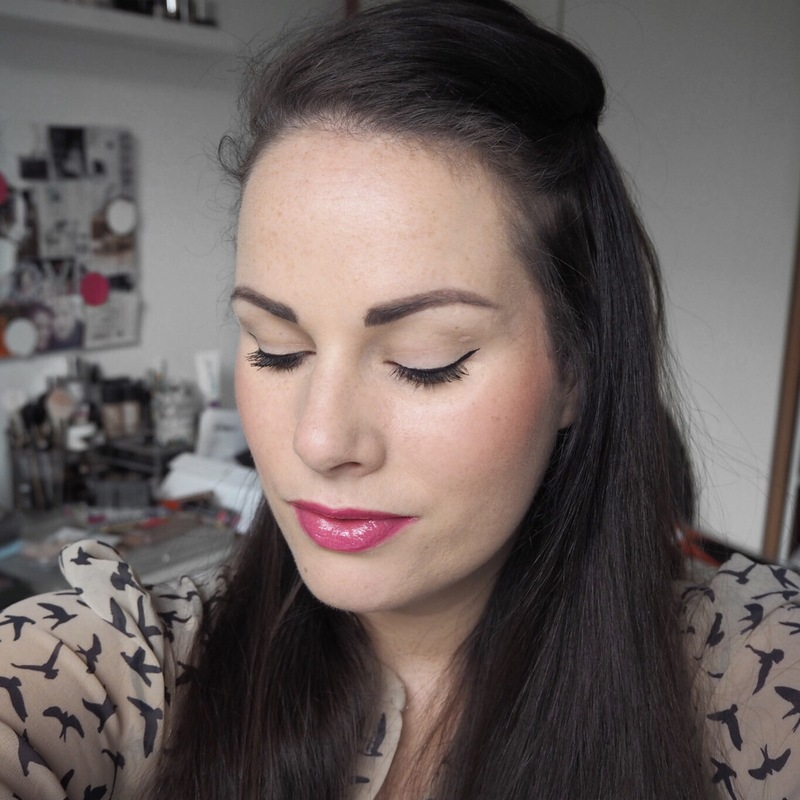 So this morning I thought, what better way to do that than with a gorgeous bright lippy colour. 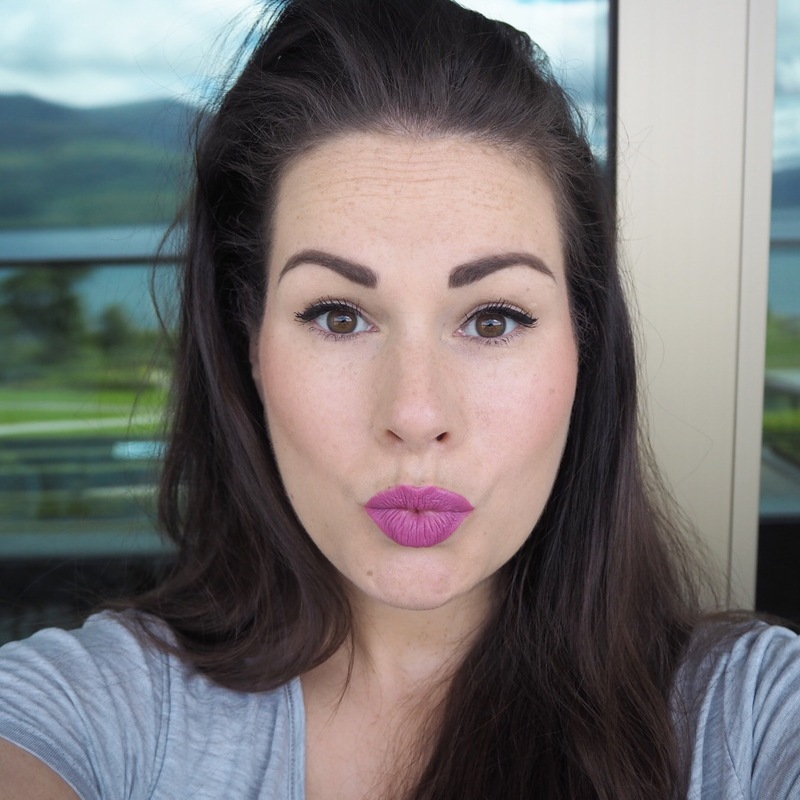 The lipstick I chose was a gorgeous blackberry shade, Marry Berry, from Catrice’s shine appeal fluid lipstick collection, a range which I have worn a few shades from recently on both Day 138 and Day 142 of the challenge. 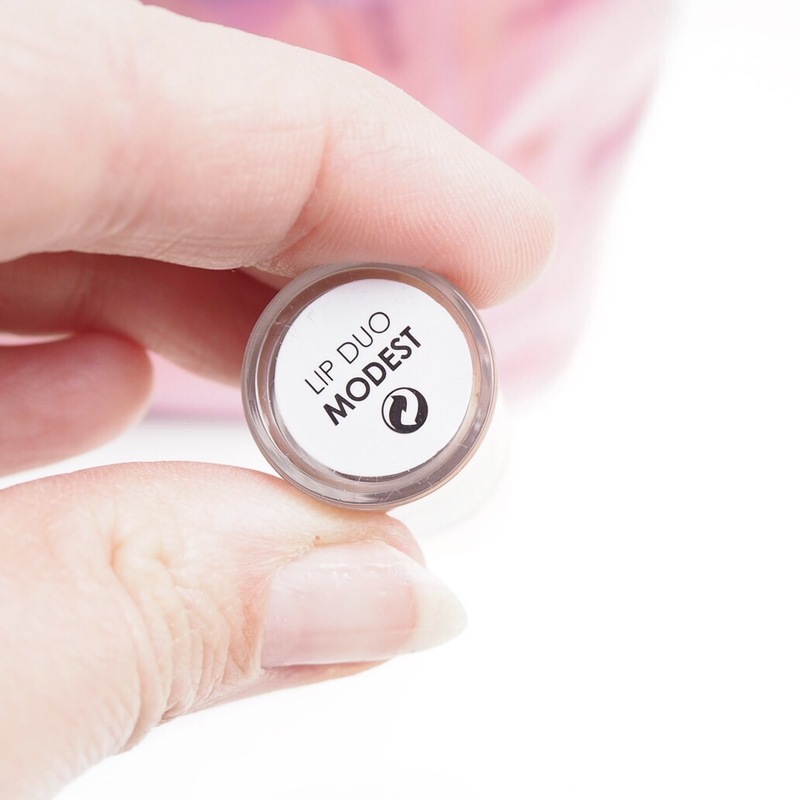 The consistency of these liquid lippy’s is thick with a vinyl-like finish that is soft and smooth on the lips. 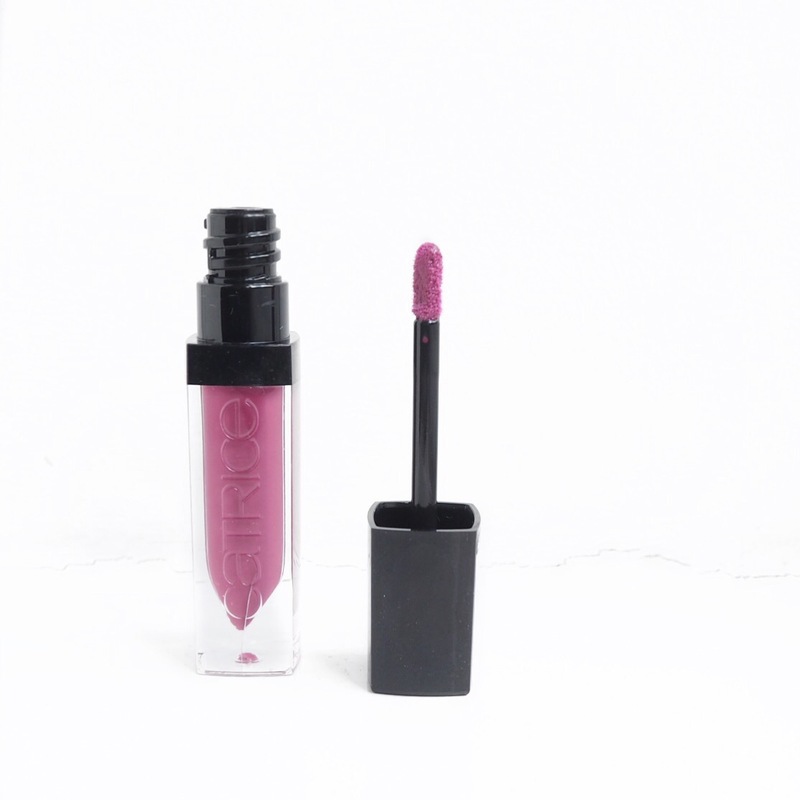 The bold pigment gives the lips a dramatic pop of colour and the thick consistency allows for a very even application that doesn’t drag or pull the colour underneath too. 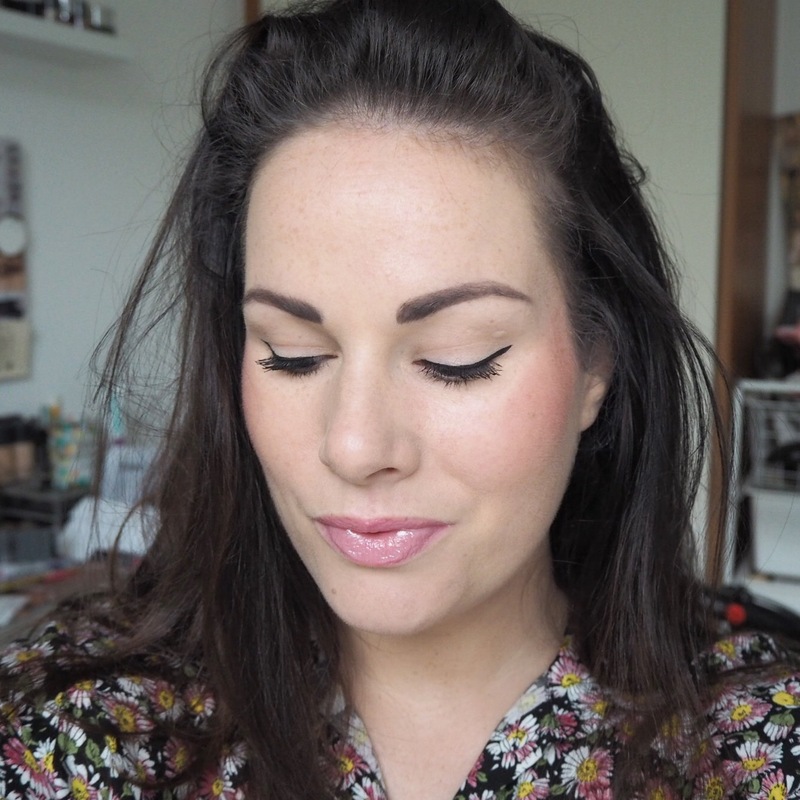 The downside to this gloss if I had to choose something, is the lasting power as you only really get an hour or two out of it per application, and it’s probably less if you’re eating or having a cuppa in between. 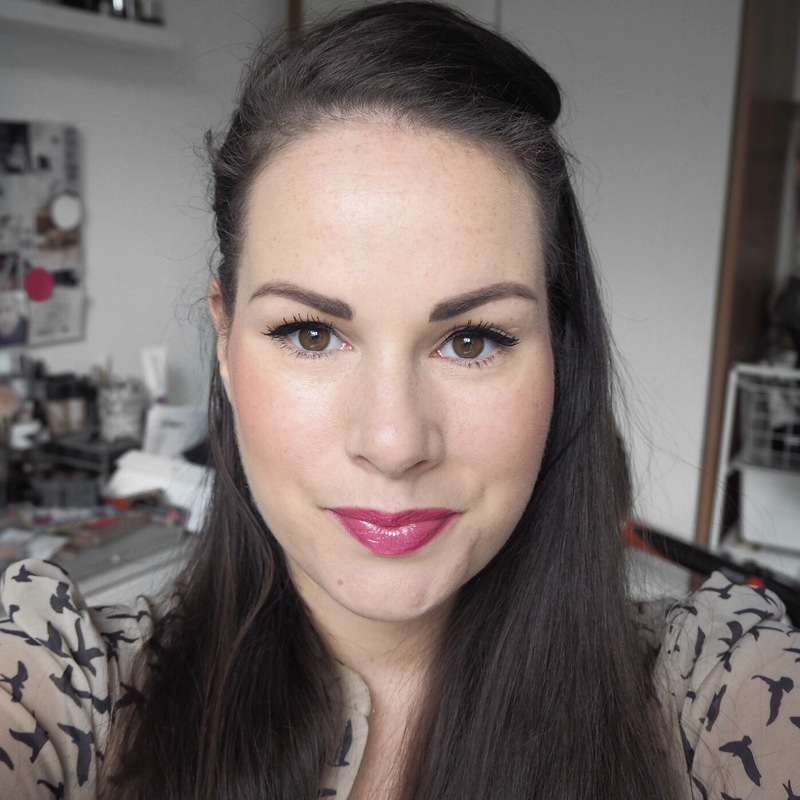 However, I did love the colour so much that really I didn’t mind having to reapply and will definitely be wearing it again in the future! 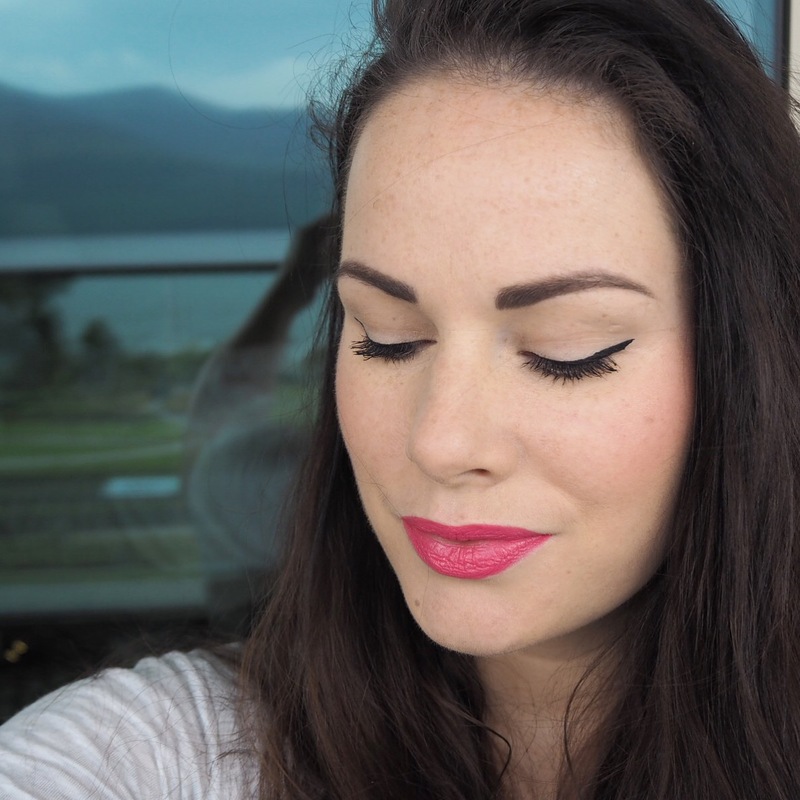 Have you tried these lippies? If so then let me know by commenting below! 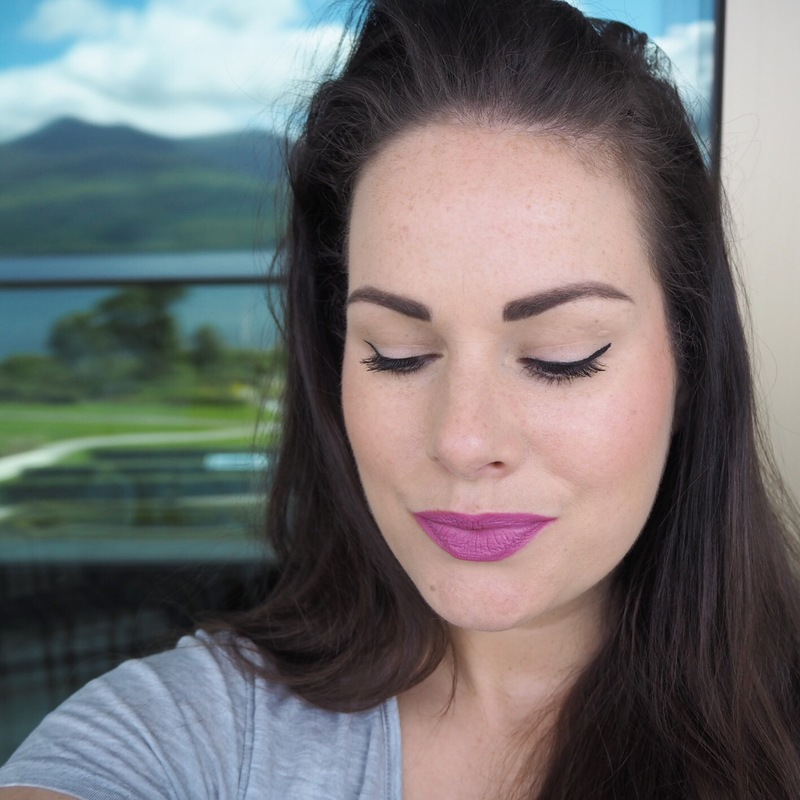 You may recall me wearing three different DuWop mini lipsticks over the past few months, and although I really liked one of the shades, Plum, I wasn’t a massive fan of the lipstick in general. 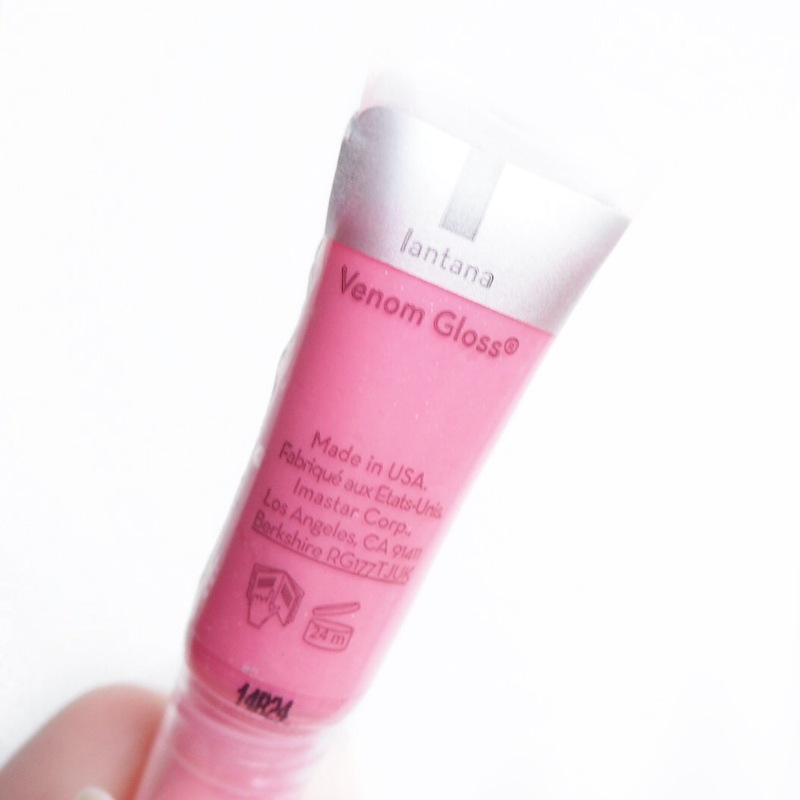 The minis were part of a trio set I bought, and when I got them, I was also sent one of their venom lip glosses as a free gift with purchase to try out in a bubblegum pink shade called Lantana. 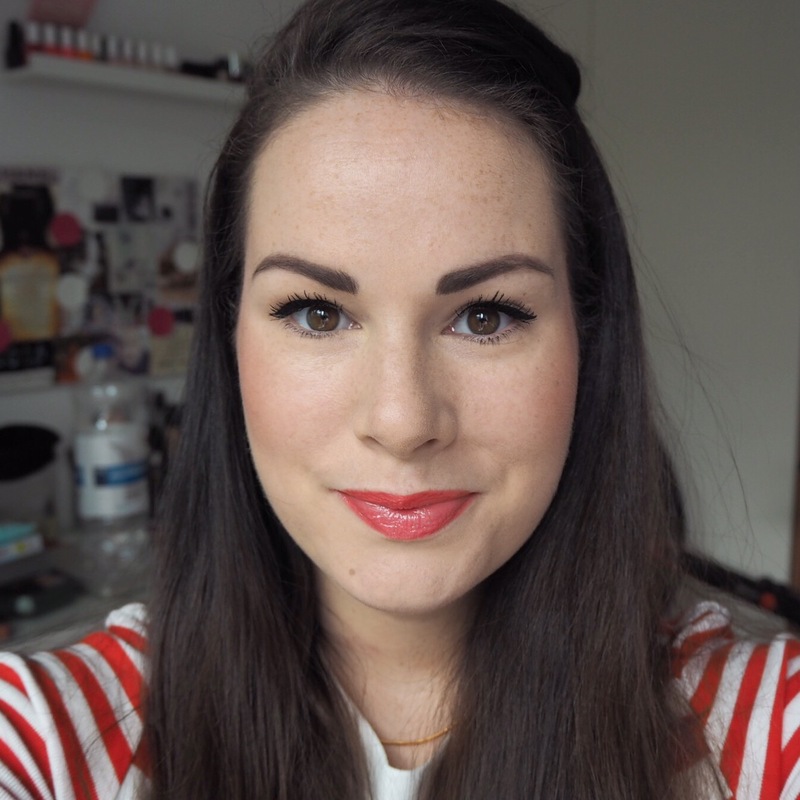 Given my feelings on the lipsticks, I didn’t have high hopes for the gloss so was very pleasantly surprised to find that I actually really liked it! 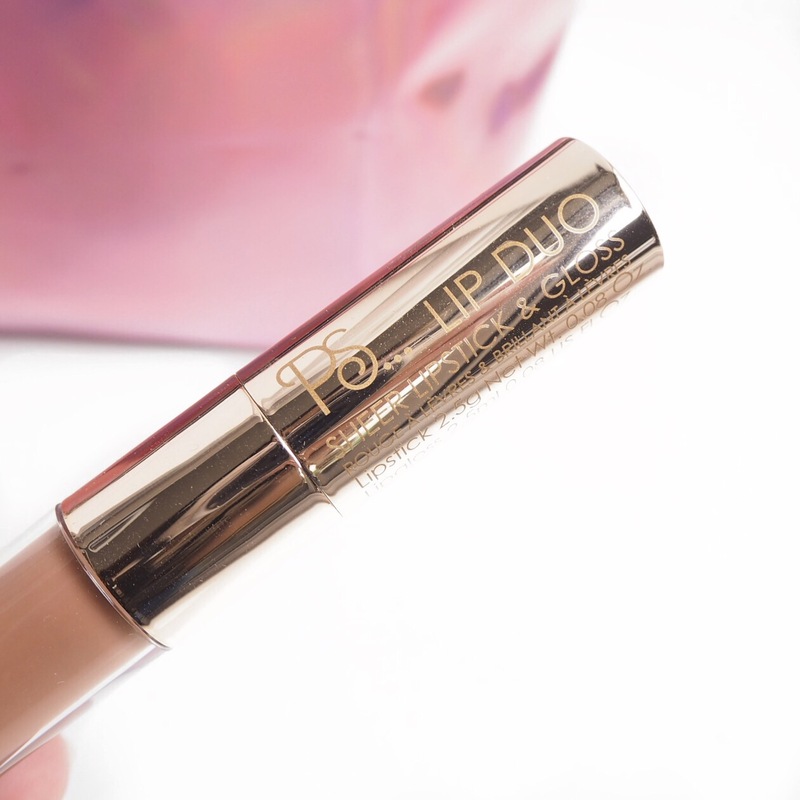 The gloss itself was thick and creamy in texture, and gave a lovely high shine coverage to the lips. 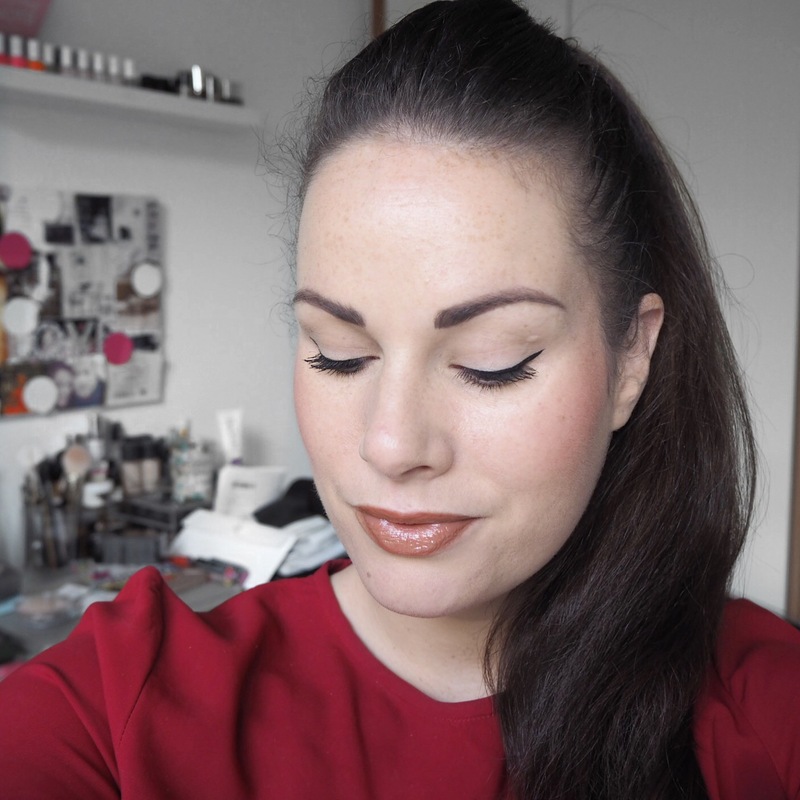 The pigment was also very good for a sheer finish gloss, and I definitely got a great pop of colour when I applied it which I really liked. 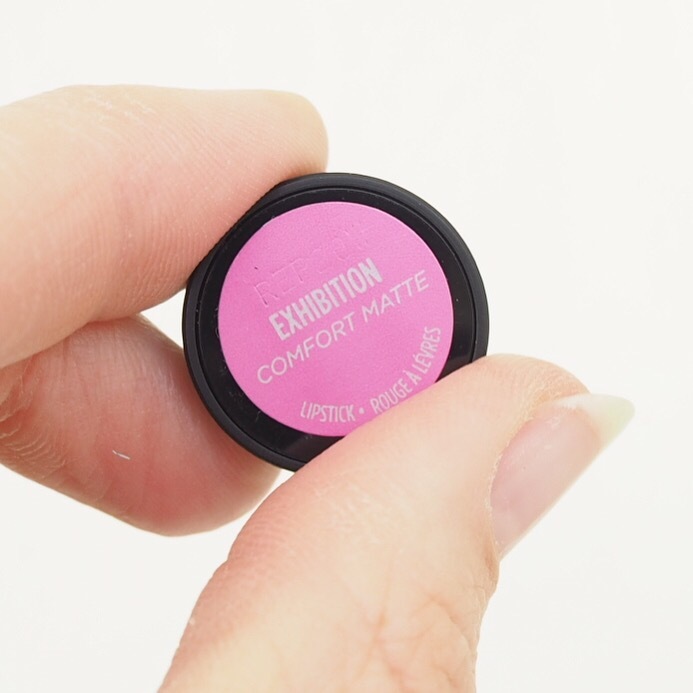 The shade as I mentioned above, is a bubblegum pink so not really my usual kind of shade, but the sheer finish made it quite soft and not too pink. Not only did it look like bubblegum, but it smelled exactly like bubblegum too which I thought might become bit overpowering or sickly throughout the day, but it didn’t at all, and I actually found it quite fun to wear because of that! 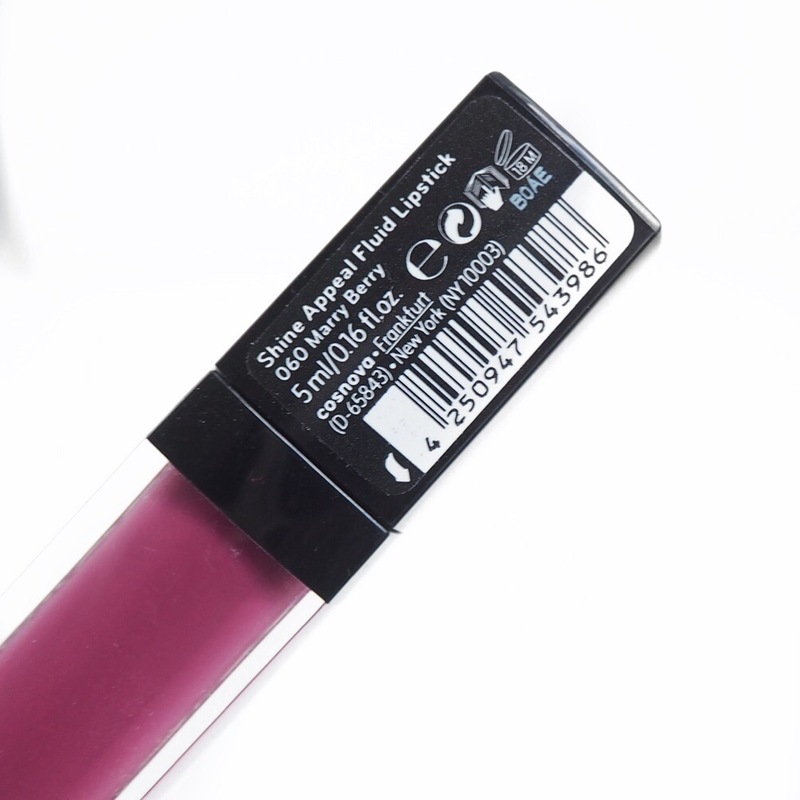 All-in-all, I’m really glad this gloss surprised me and I think it’s a great budget gloss option that brings a little something fun with it! 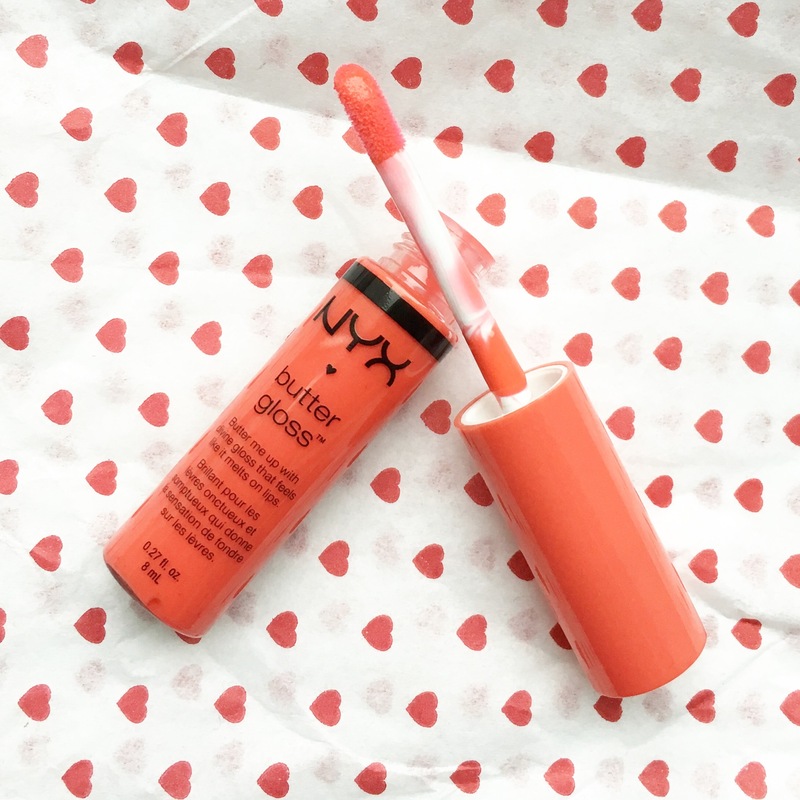 If you’ve been keeping an eye on my challenge, you will know that over the past few months I’ve become quite the fan of NYX Butter Gloss, mainly due to its soft vinyl-like glossy finish. 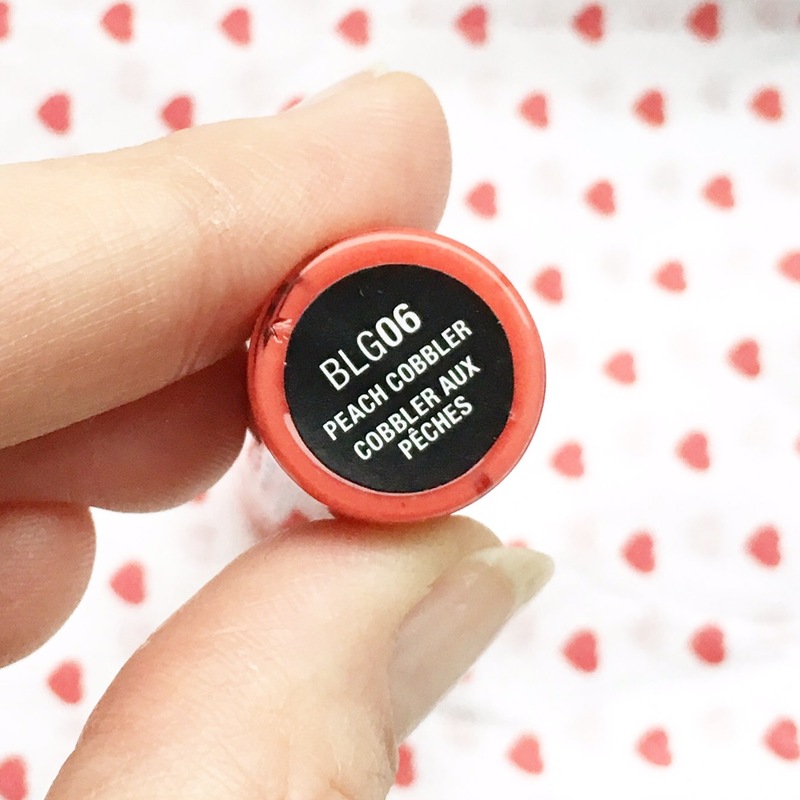 Yesterday I tried out my third butter gloss shade, Peach Cobbler, which definitely had more of a red undertone than peach or coral, but was a gorgeous orange red shade nonetheless and one that I loved wearing. 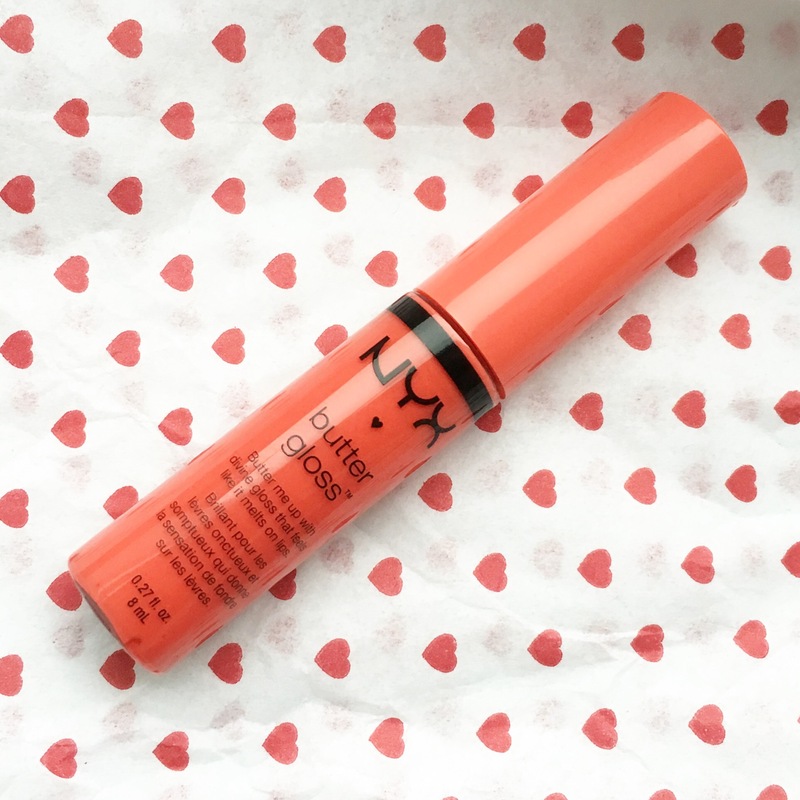 Lip glosses have never been my preference over lipstick, but I’ve definitely begun to like them more after trying products like this one because, the dreaded sticky lip hair dilemma isn’t an issue at all. 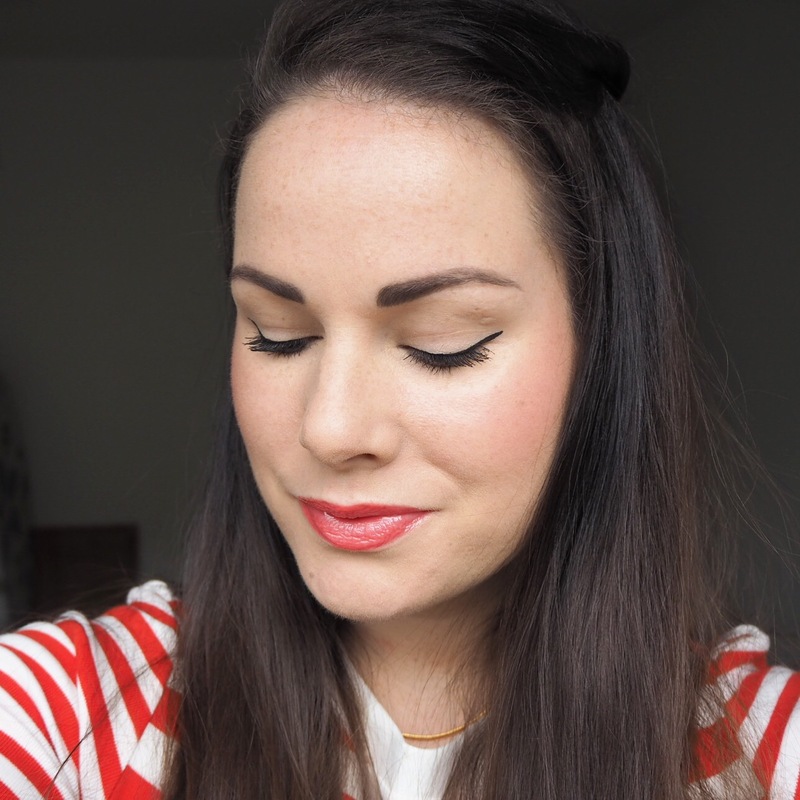 I think over the years that’s what maybe put me off gloss, but now that better options exist on the market, you can achieve a very high-shine lip look without the annoyance of getting blinded by the hair stuck to your lips, which, if you haven’t already guessed, really was a pet hate of mine! 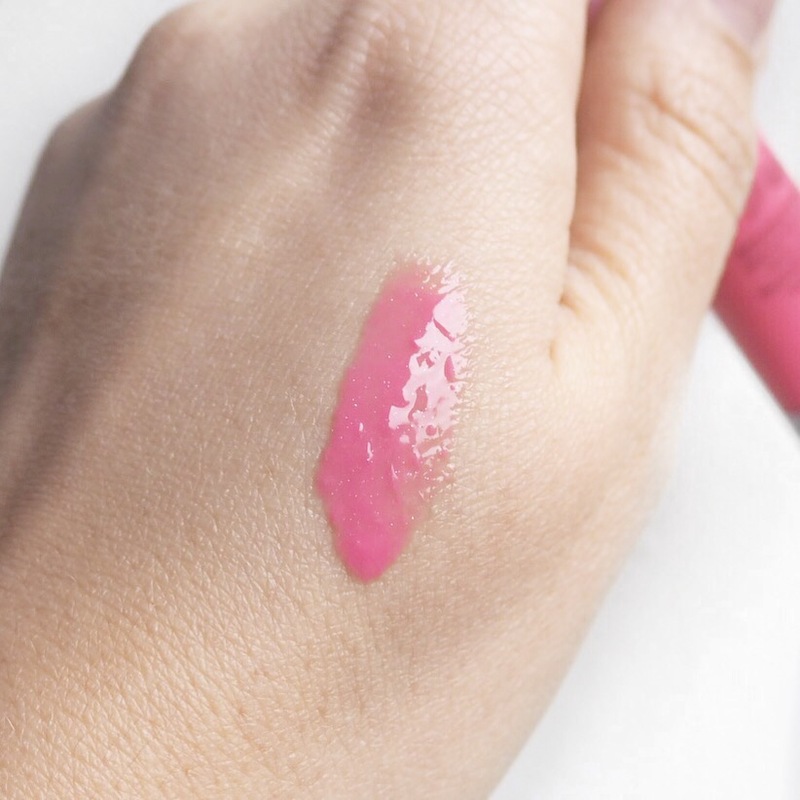 But apart from zero stickiness, the texture of the gloss is very smooth; the consistency is thick without being too thick, and though sheer, has a nice pigment to it which glides on so easily. 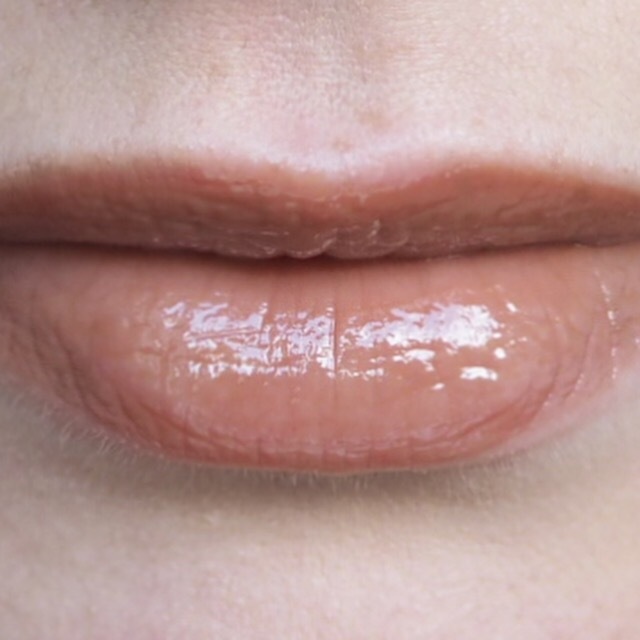 I find these glosses great for every day wear especially when you’re out and about and want a subtle on-the-go lip look. 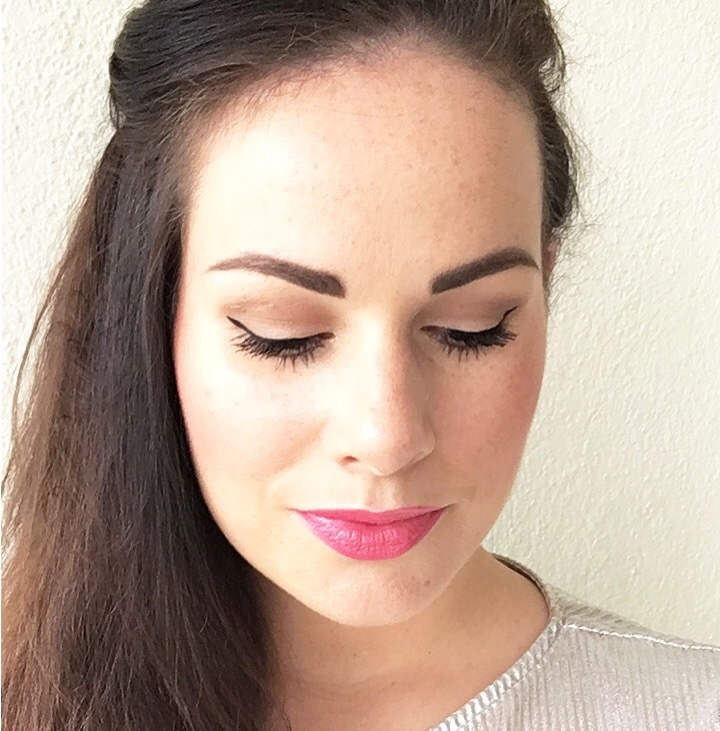 They have just enough pigment to give a gorgeous pop of colour but won’t overpower your makeup which means they can easily be paired with either a bold or neutral eye too. 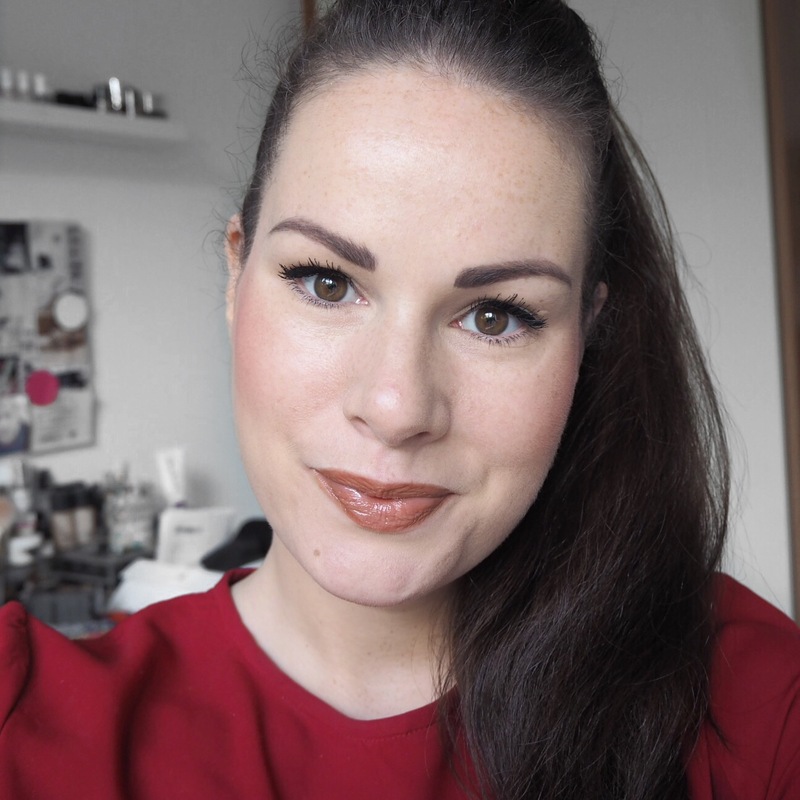 You will have to reapply as the day goes on like you would any gloss lippy, but the staying power isn’t bad and I think they are a great versatile, all-rounder lippy option. 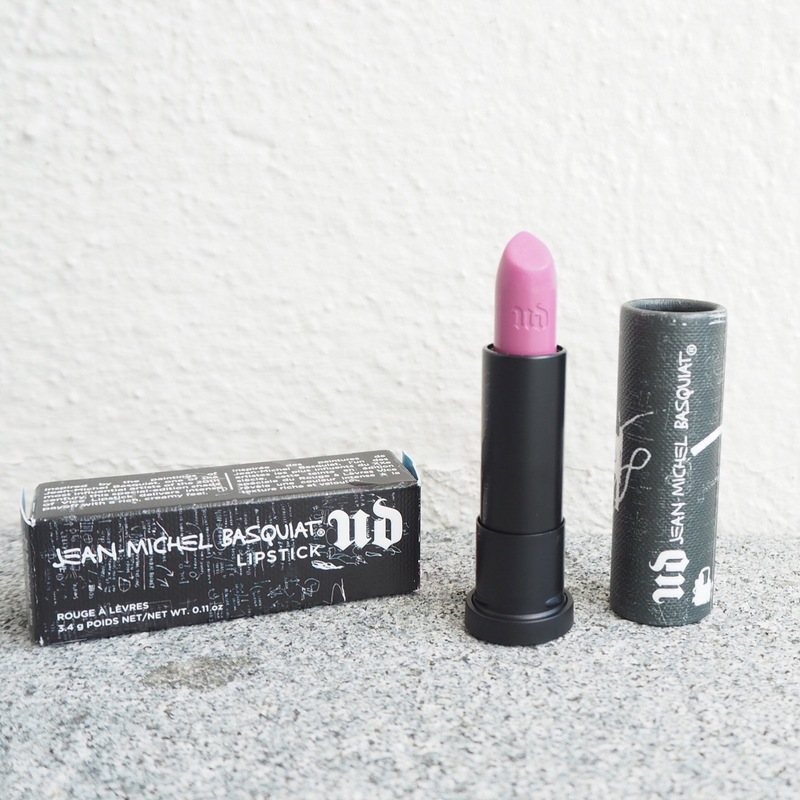 Urban Decay’s most recent limited edition collaboration collection with Jean-Michele Basquiat, is one of the most exciting collections to be released in a long time. 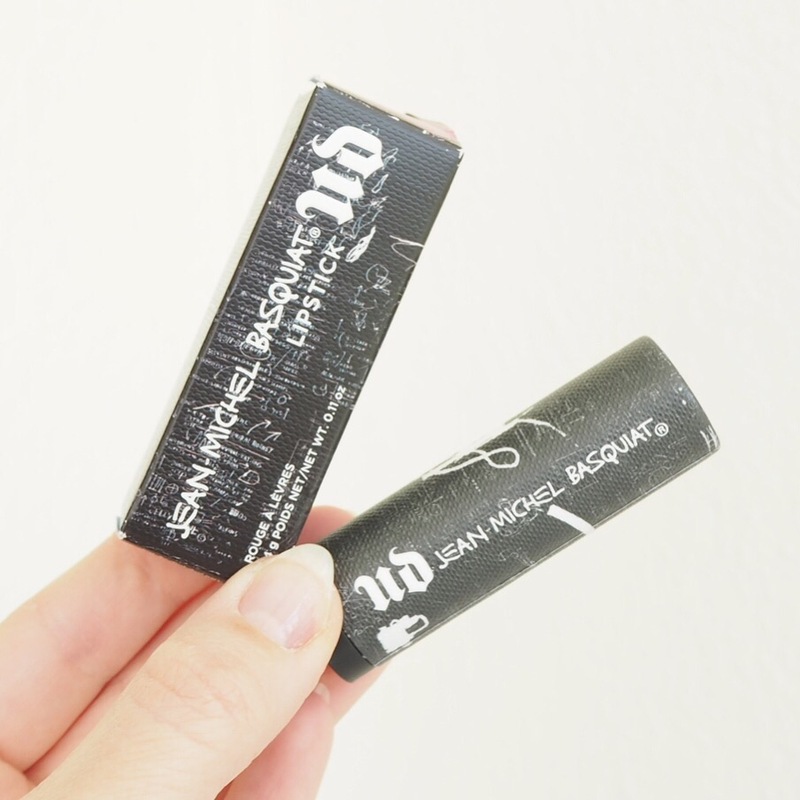 In fact, I think it’s my favourite collab collection since NARS’ Andy Warhol one from a few years back. 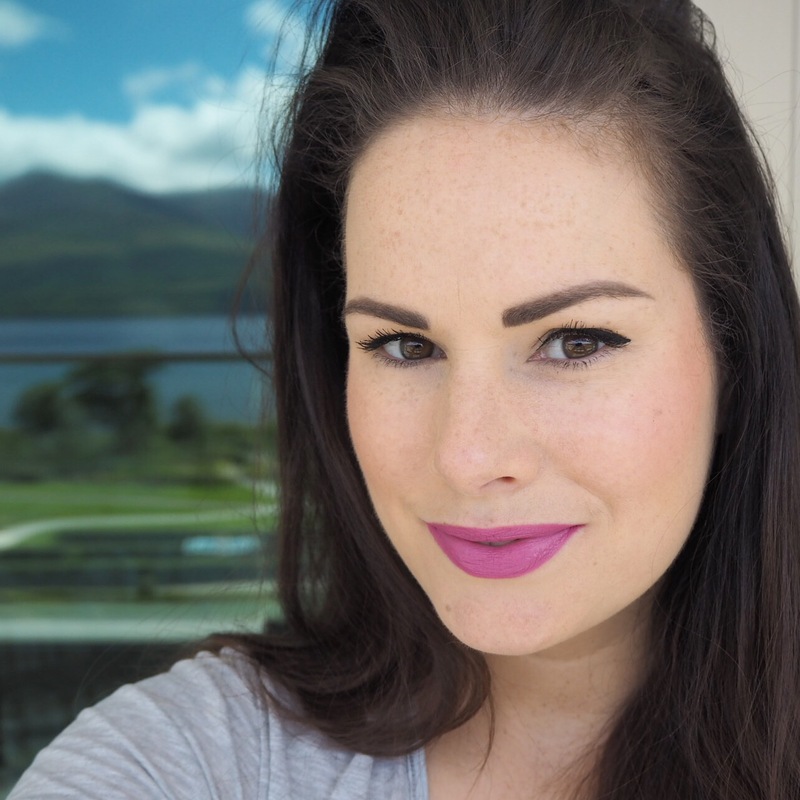 Funny that both my favourite makeup collabs are for two of the world’s most famous artists; I have been a huge fan of Andy Warhol for as long as I can remember – I’m obsessed with how he took everyday ordinary things and made them seem special and different. Jean-Michele came from a similar place with his graffiti style art, and both him and Warhol worked together on many projects, as well as having a close friendship. So, as you can imagine, when this collab was announced a few weeks back, I was so frickin’ excited to get my hands on it because I just knew the shades and pigments would be insane! And that, they are. 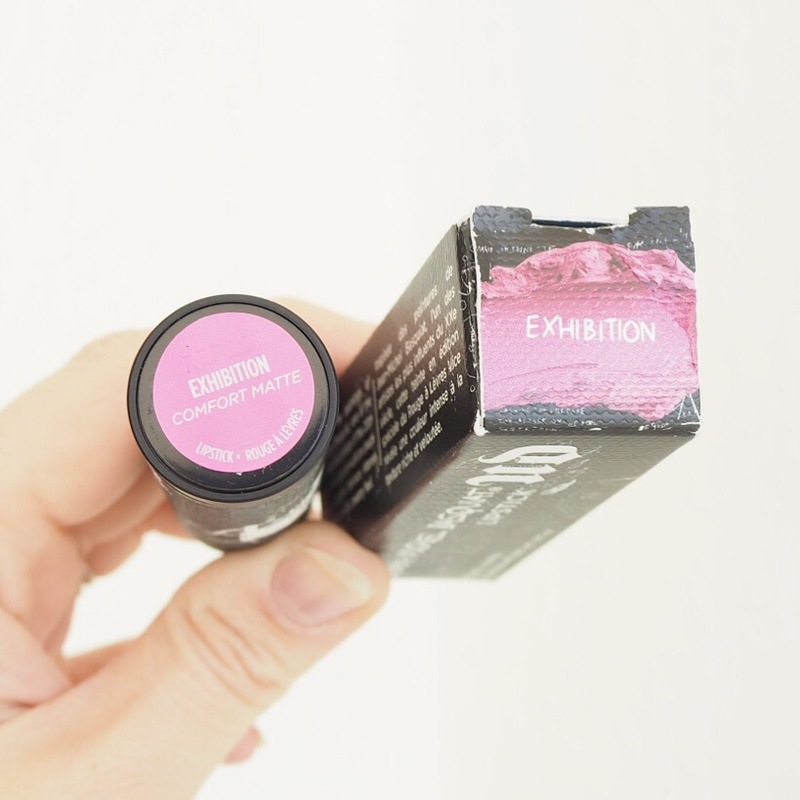 While I’ll be reviewing the blush palette in a separate review, for today’s lipstick choice, I opted for this amazing pink / purple from the collab called Exhibition and it is simply divine. 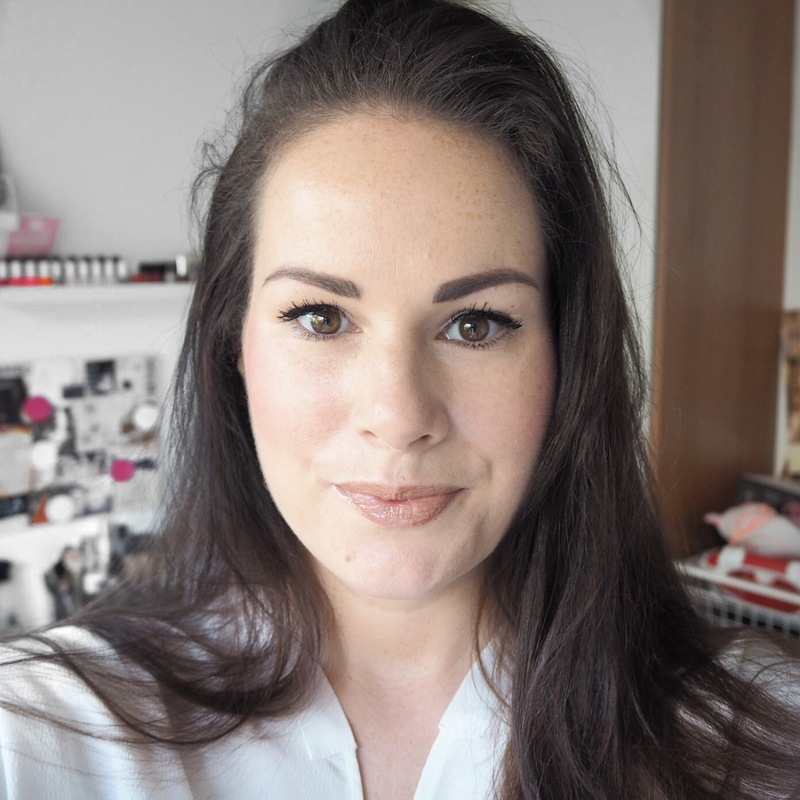 Comfort Matte finishes are my favourite of all the Urban Decay lipstick finishes so from the beginning I knew I would love this. 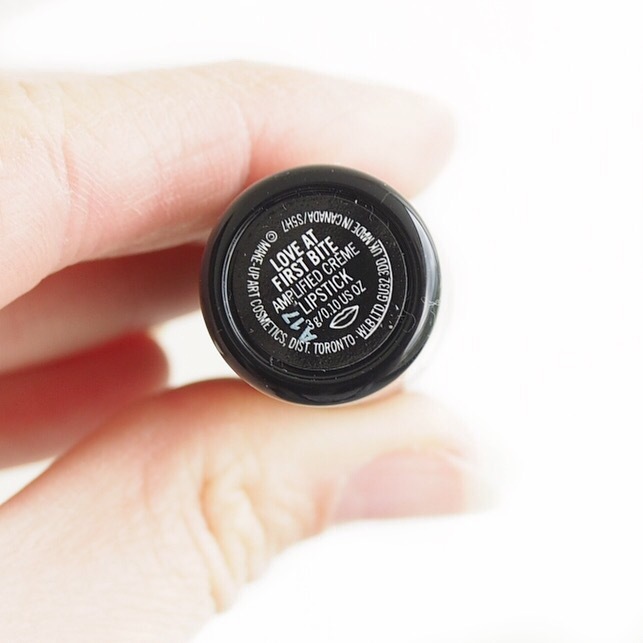 The formula is incredibly creamy, and the pigment is to die for. With just one layer, you get a very dramatic colour pop and I love how this shade is something different to my usual choices. 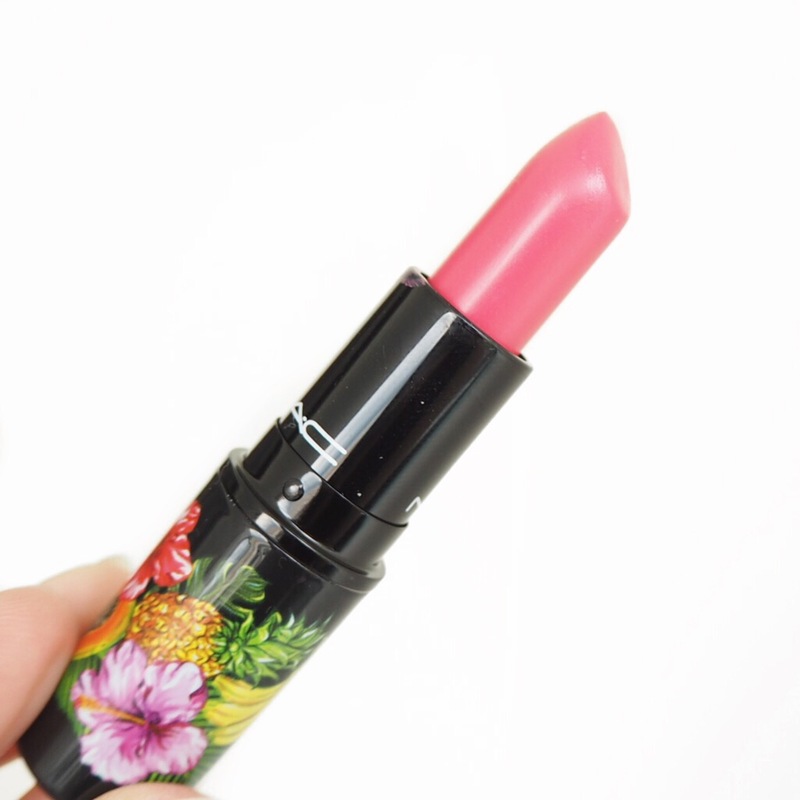 Because of the semi-matte finish, the lasting power on this lipstick is brilliant. I put it on early in the morning, had breakfast and spent the day in the spa, and even after the jacuzzi and steam room, it was still pretty much in tact! 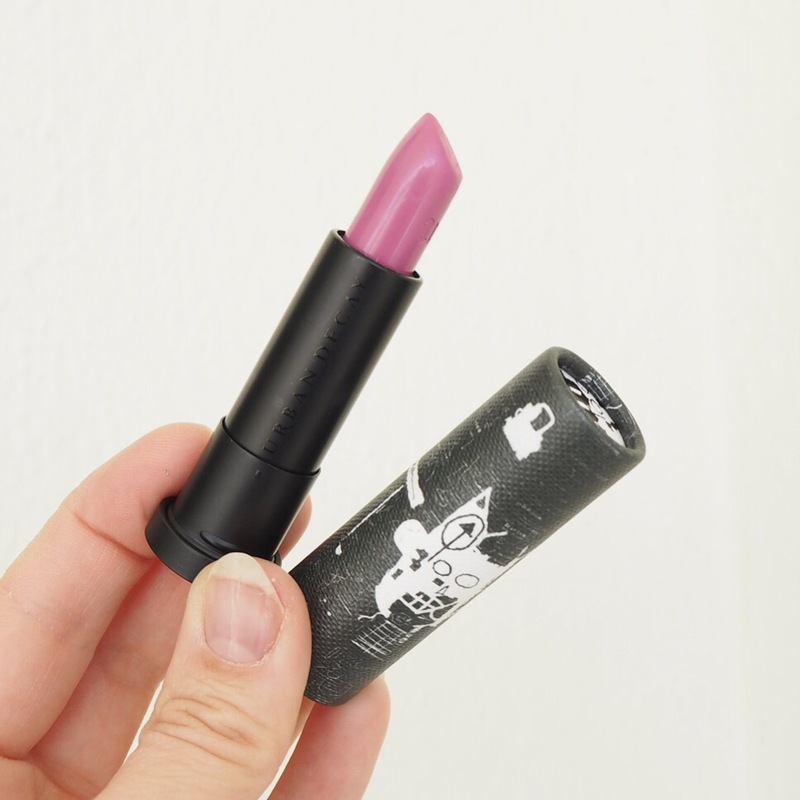 I knew I would love this, and I wasn’t wrong; it’s such a gorgeous shade especially if you’re looking for something a bit different and the colour pay off is everything you want it to be and more. 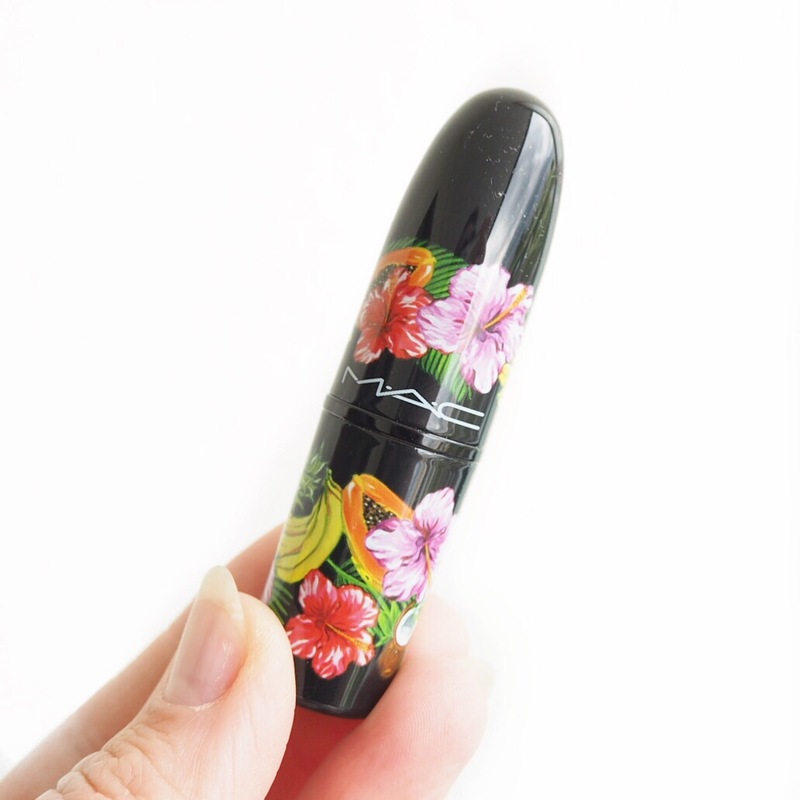 Do you like collaboration products? 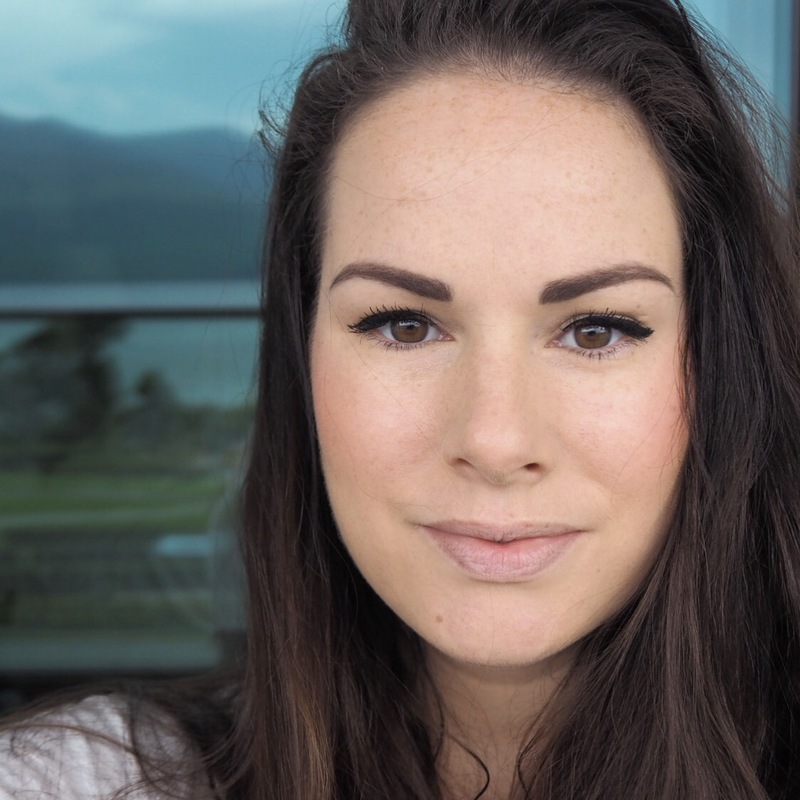 Sometimes they can be a bit gimmicky, but I can assure you, this one is definitely worth it! 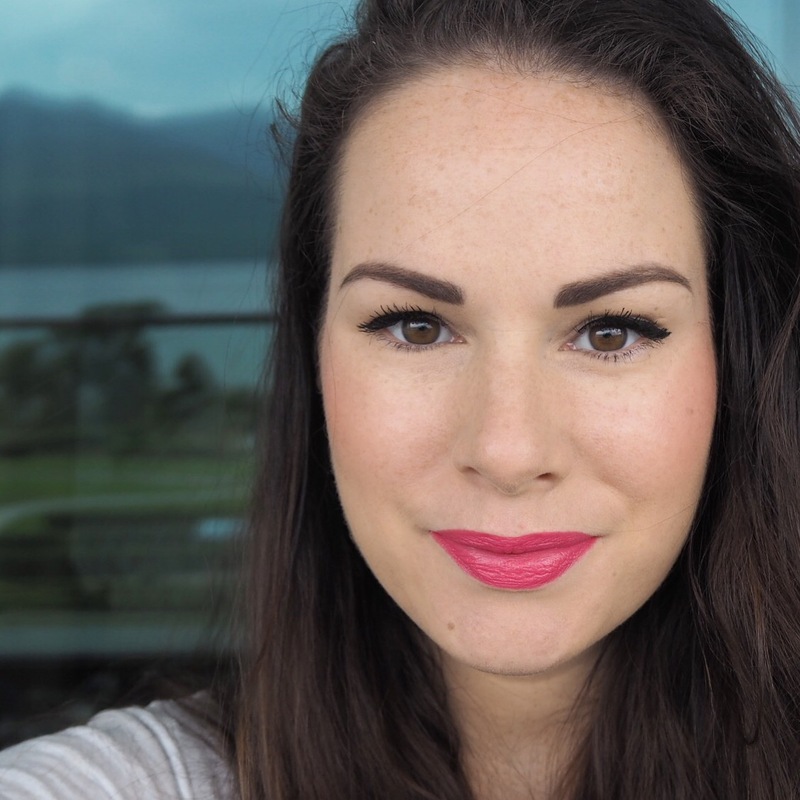 Last week I wore one of these lovely Clinique lipstick and lip gloss duos for the first time in a raspberry shade and really liked it. 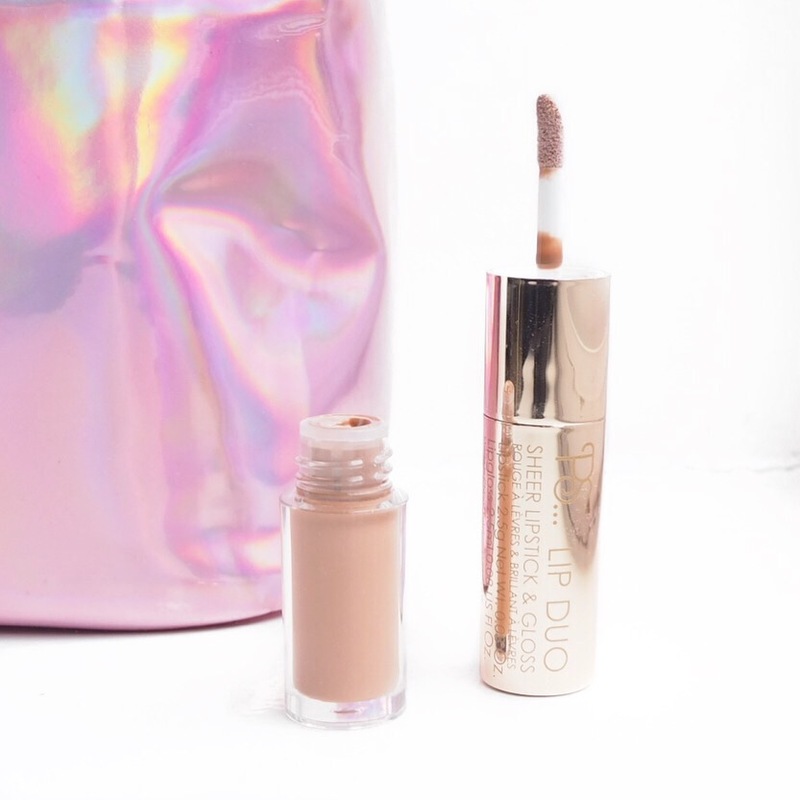 One thing I noticed about it at the time however, was that both the lipstick and the lip gloss elements were lovely colours individually and so today, I decided to split the duo up and try one element on its own. 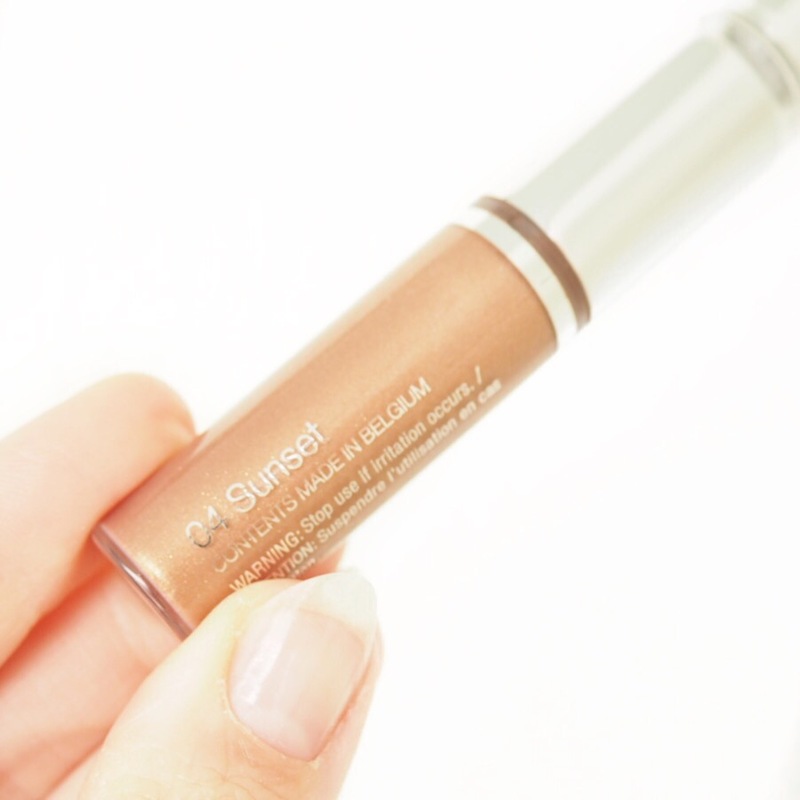 The shade I opted for is a lovely shimmery gold lip gloss shade called Sunset, which has a caramel tone to it and gives a lovely soft metallic shine to the lips when you apply it. 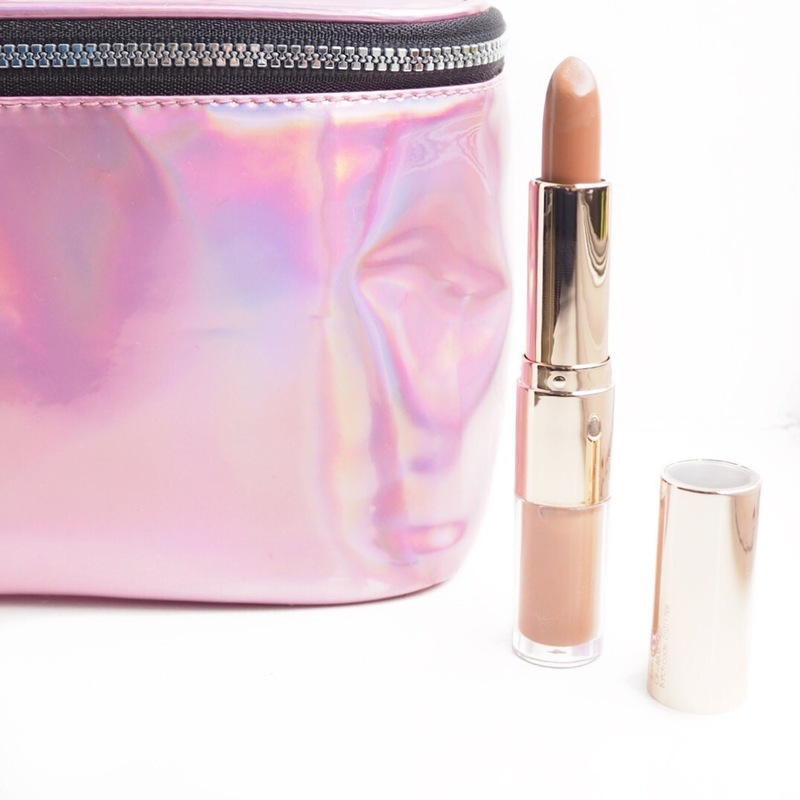 It’s one of those lip products that’s hard to photograph because though it is shimmery, it’s not glittery, and tends to look different in different light. 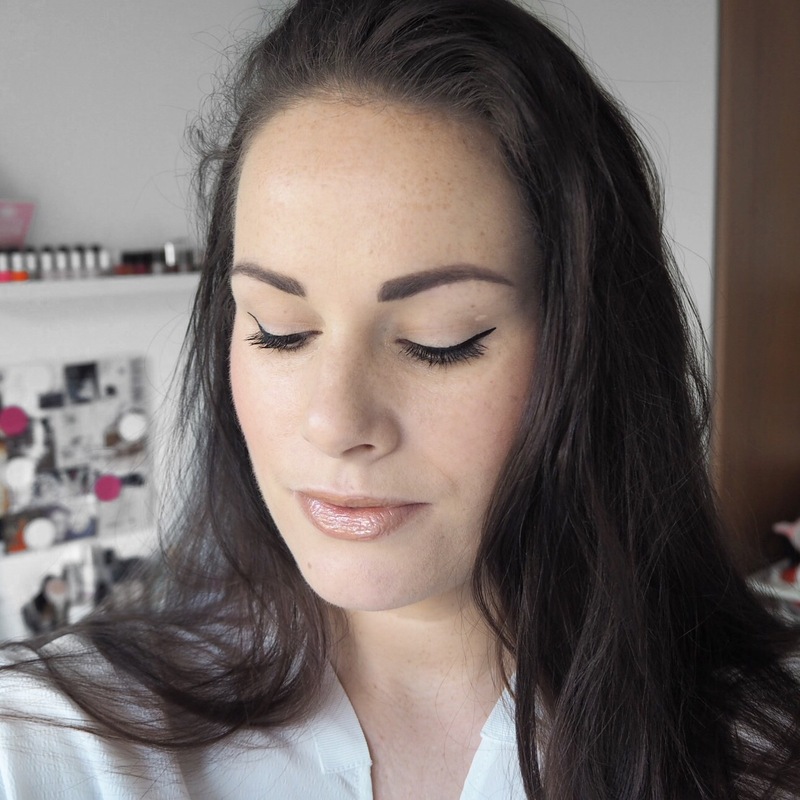 Today was a gorgeous sunny day in Dublin and at times, it really looked like I had a metallic lip which I absolutely loved! 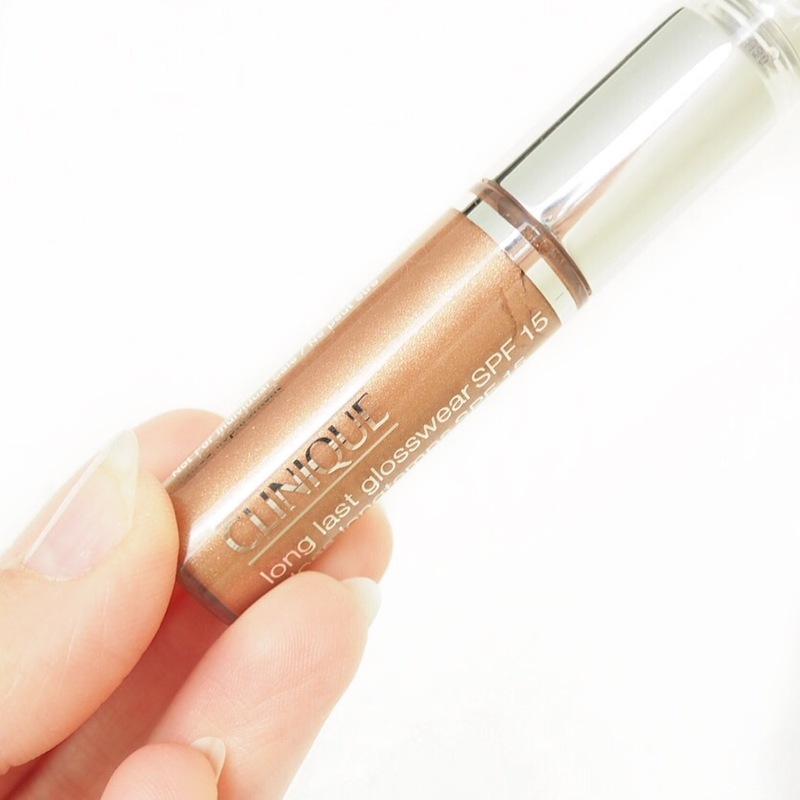 Because of the sheer finish, the pigment itself isn’t amazing, but that’s where the shimmer particles help because in this case, they add another dimension to the gloss. 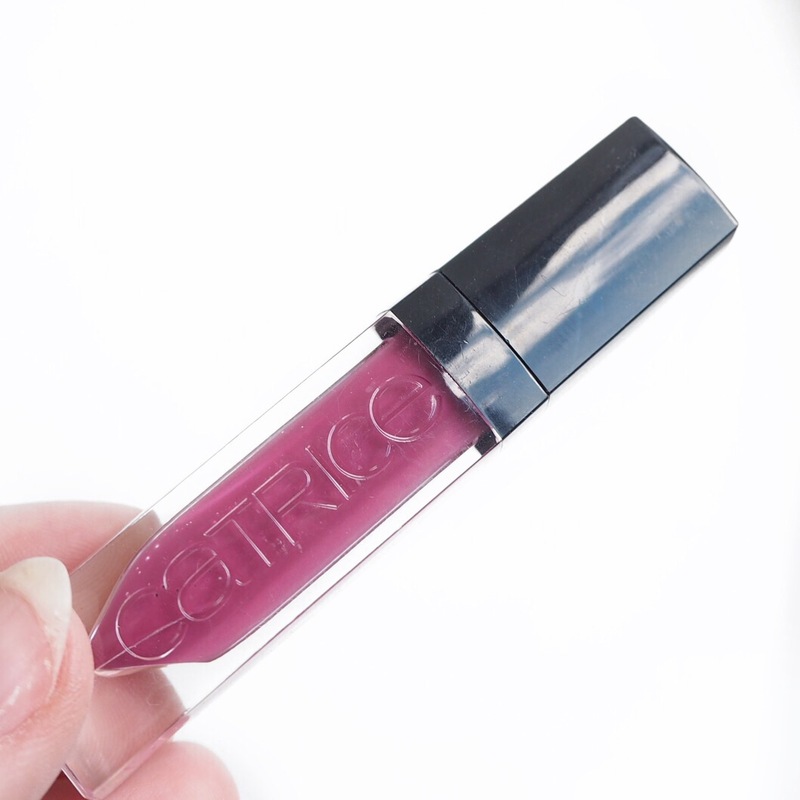 It is a little sticky to wear which can be annoying, and after trying this separately, I do think I prefer the impact you get from pairing the gloss and lipsticks together, especially as the lipstick reduces the gloss ever so slightly giving it more of a semi-gloss finish. 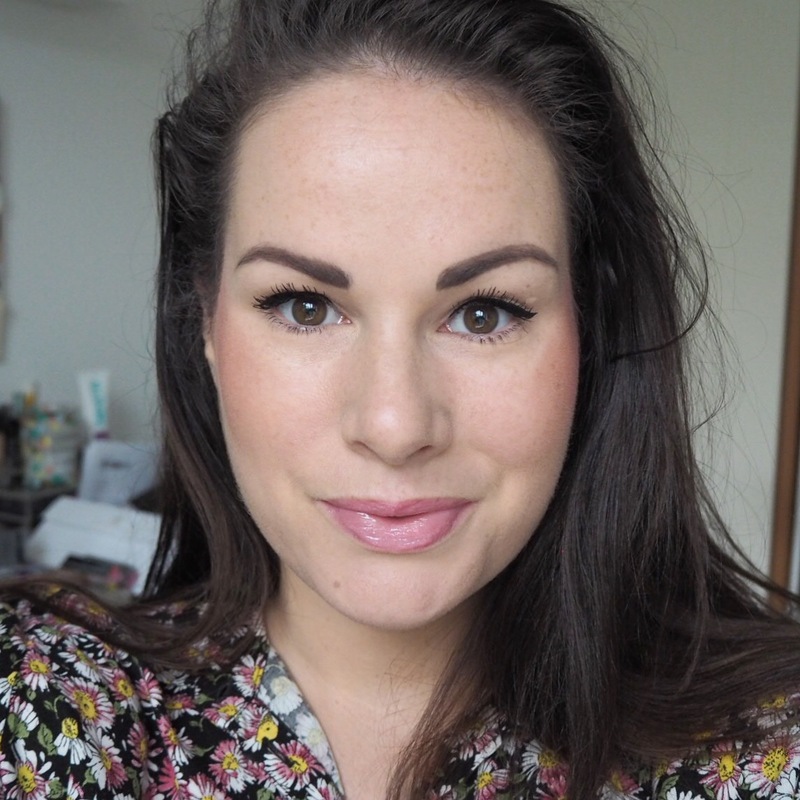 I’m glad I tried the gloss on its own as I’ve never worn a Clinique lip gloss before, and I did like the natural gold shade. 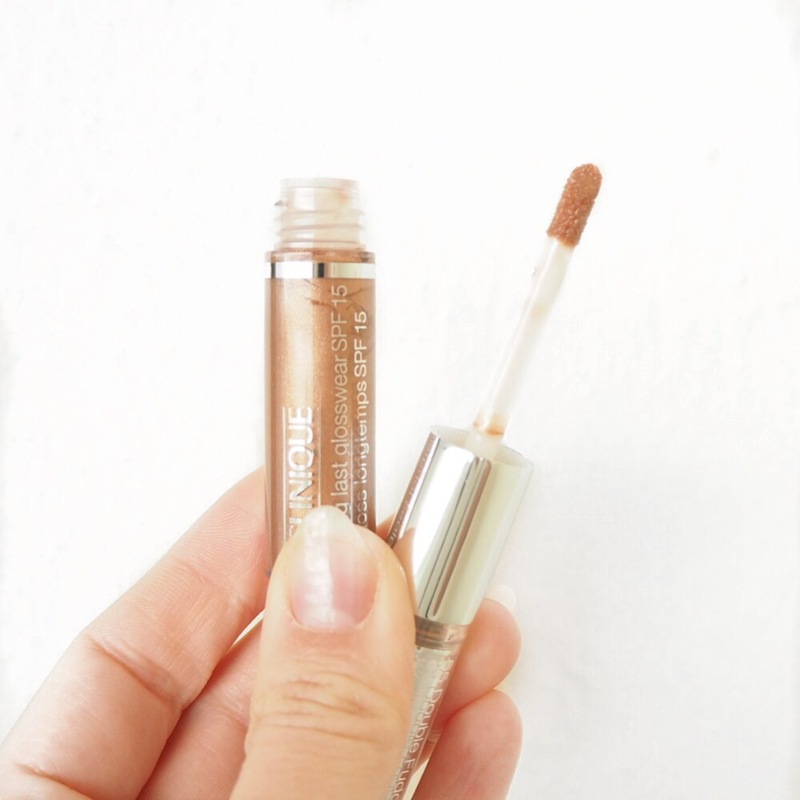 It’s definitely a handy one for when you want a shine neutral lip look.